Hotel Indonesia Kempinski Jakarta, through its popular beerhouse, Paulaner Bräuhaus, brings you MAYFEST 2019! Our Paulaner's culinary mastermind, Chef William will present his special menu throughout April, which is the Swabian pasta pockets filled with minced beef and spinach served in beef broth. Calling all ladies to dress up, put on your striking heels and join our Ladies Nite at Paulaner Bräuhaus. Every Wednesday, 30% off* on all beverages, for ladies only! 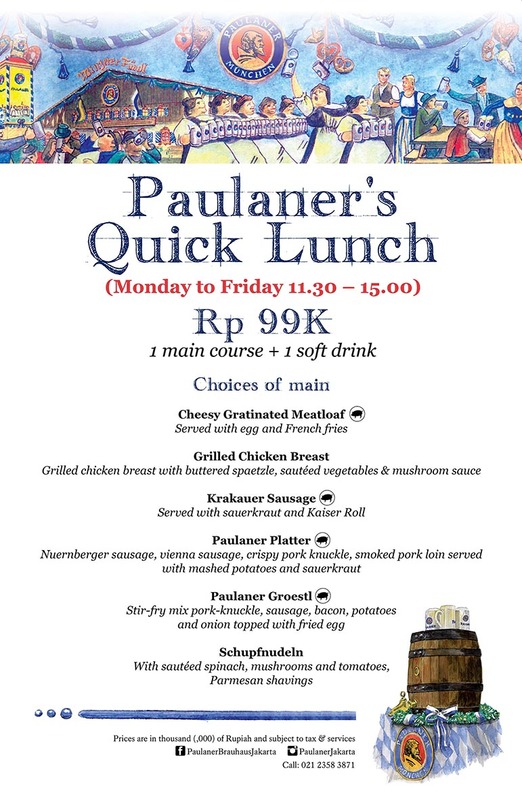 Paulaner Bräuhaus Jakarta offers you the ultimate Quick Lunch. Get one main course plus one soft drink from Monday to Friday 11:30 - 15:00 for IDR 99,000++. Pork belly for your whole family! Preorder the day before and you get enough for 6 people to feast! Chef Kaz will take you on an extraordinary treat if you join his cooking class. From OKU's bar, handcrafted by OKU's bartenders. A fine drink to tickle your appetite before your dining experience at our premium Japanese restaurant. Experience the finest Japanese cuisine in town! OKU KASE offers you a tantalising dining experience using only the freshest ingredients specially crafted by Chef Kaz in his kitchen playground. Weekend Brunch at Signatures is filled with a wide array of local and international delights. Bring your kids to our Kempinski Little VIP Lunch at Signatures Restaurant! Our talented chefs have prepared various Indonesian Ramadan favourites to break your fasting! To share the holy month's blessings, Kempi Deli offers Eid Hampers for your family, friends and colleagues. Up to 50% off every single night! Our home-made products are so fresh that we have to replenish them every day! Take in the view of the Jakarta skyline with your beloved and indulge in a five-course sharing menu for two with sparkling wine. ALL YOU NEED IS LOVE... AND GIN! An after-work night cap with two types of Infused Gin (Lemongrass and Mint) using Hendrick's and Monkey 47, mixed and served right on your table!